Being Easter, it was appropriate that hot cross buns should accompany our coffee at the Apple Pie Cafe in Ambleside, prior to striding off up the hill (the wrong way, in mine and Jenny's case!). Despite a few initial problems with Andrew's GPS, we were soon warming up, despite a headwind, on the ridge leading north to Red Screes. "I can't see any caramel"
Perhaps next time, a batch of the usual caramel shortbread would be better! Behind the wall, additional windproof layers were pulled from rucksacks. The forecast indicated severe wind chill, and we were just about to experience the worst of it. 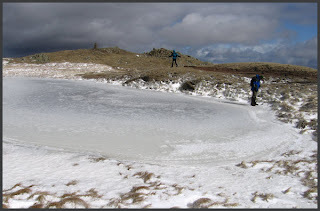 Nearly at the summit of Red Screes, the temperature did indeed feel like the estimated minus 18 degrees C, with cold fingers, and even cold teeth. Some fun was had by Martin and Richard who tested the strength of the ice. Although some cracking was heard, there were fortunately no wet feet. The views down the Kirkstone Pass to Brothers Water were lovely, with sharp contrasts between sunlit fells and lakes, and those shrouded in grey cloud and snow showers, which were sweeping across frequently. 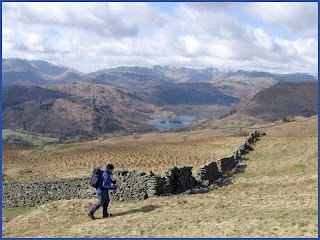 Our route continued towards Scandale Pass, over snowy grass, then an icy path next to the wall. Jenny managed to lose a leg down a hole, retrieving it with Richard's help. At the pass, the sun made a very timely appearance as we sheltered on the leeward side of the wall to have lunch. 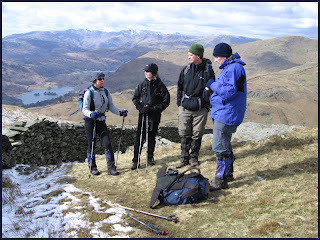 Dove Crag was our final objective. 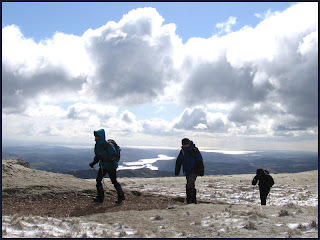 There were slate grey clouds with sunlit snow in one direction, and in the other, sun on Windermere creating a ribbon of bright water, with another on the distant sea of Morecambe Bay. The grey clouds finally caught us up, and snow fell heavily for a few minutes, disappearing as fast as it had arrived. 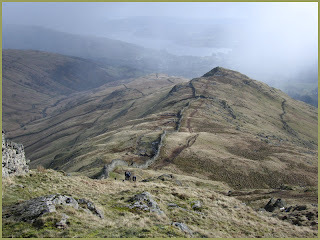 With Ambleside in our sights, the descent was slowed only to accommodate Richard's problem ankle and two episodes of cramp for Andrew, the first being on the top of a large stile, from where he couldn't move for some minutes! 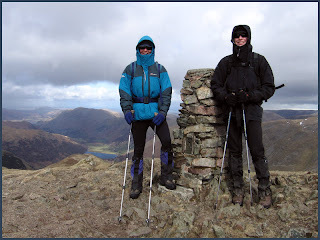 Today, I was struck by the significant number of people on the fells in jeans. OK, all precipitation was falling as snow, not rain, but maybe the message isn't getting out as it used to (or less of the population are being well prepared by Scouting!). The journey back to Manchester was strategically delayed by a visit to the superb Doi Intanon Thai restaurant in Ambleside, where the hot chillies were an ideal antidote to today's chilly wind. Thank you Andrew for chauffeuring duties. 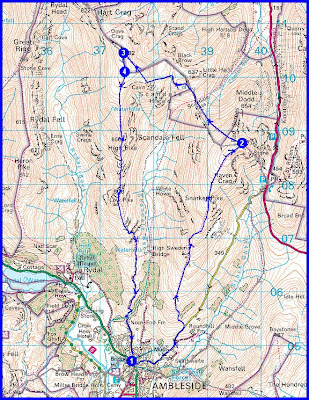 Here's the route - it was 15km with about 1050 metres of ascent, and took just over 6 hours, including about an hour of stops.